➡ learn to do it yourself. 1. You pay someone to run your ads for you. Let’s change things around, imagining that you’re running your OWN ads. Because return-on-investment can’t be measured in just ONE launch (or one month of an evergreen funnel). Let’s say you go to relaunch again in 6 months. You’ve learned a TON about what worked and what didn’t in your previous launch, and you’ve improved everything about the sales funnel, from the opt-in to the promo emails to the testimonials on your sales page. Price of your course: $500 <–but it’s probably time to raise the price, don’t you think? Average cost per new subscriber from ads: $2 <– maybe your leads are even cheaper! % of FB ad leads who buy your course: 2% <– damn, you doubled your conversion rate! See how much more money you can make from the same investment in ads? I am dead certain that the second time around, it’ll take you way less time to put together and monitor your ads. All you need to do is modify your best performing ads from the first round, do a little duplicating magic in the Ads Manager, and voila! Facebook ads are so. much. simpler this time around. There are things in MY business that I dream about permanently outsourcing. (Writing sales copy, for example.) I fully intend to have a dedicated copywriter on my team one day, so I can focus on other things that I don’t completely DREAD. But here’s the thing: if that copywriter flakes on me, calls out sick, or suddenly stops being effective, I won’t be left in the lurch. I’ll be able to SEE if the quality of her work is starting to go down. I’ll be able to pick up the slack in the case of an emergency and still write DECENT enough sales copy. I see people posting about this in Facebook groups all. the. time. And I always wonder: does this person know WHY the ads didn’t work? Did the consultant not know what they were doing? Or were there problems with the offer/the copy/the audience/the tracking? 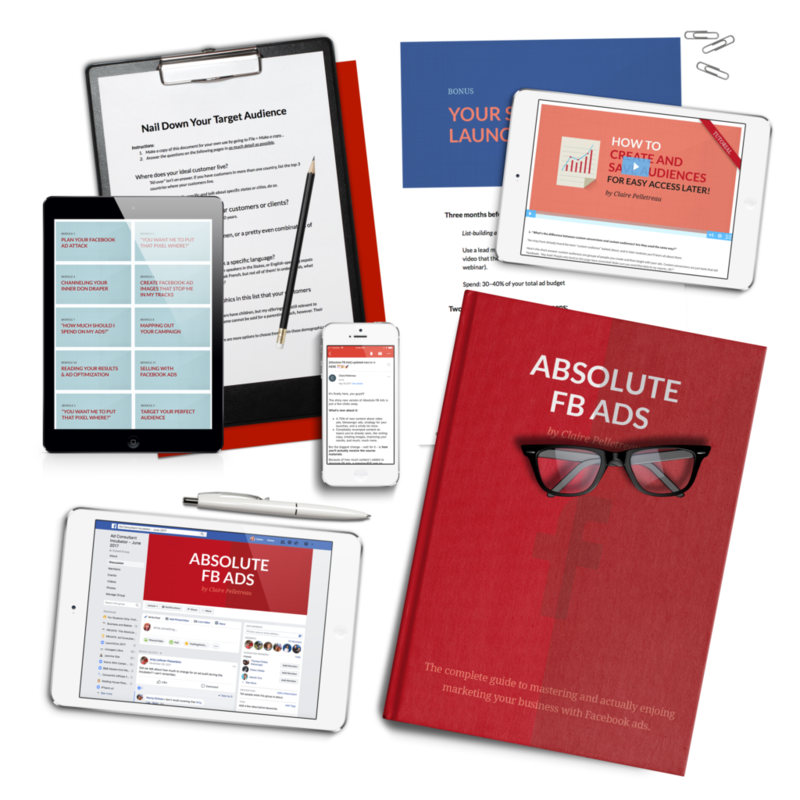 Most hugely successful business owners will tell you that, at the very least, you need to have a BASIC KNOWLEDGE of Facebook ads when you eventually outsource it. That way you can evaluate that person’s work and not blindly trust them when they say things are going great. Unless you’re consistently launching $2,000 products in your business, the economics of outsourcing Facebook ads don’t usually add up in your favor. That’s because you have to spend money on your ads *and* the person running them. The cost of the consultant cuts DEEP into your profits (not to mention all the other things you’re spending money on in hopes of having a successful launch). I’d much rather see you spend your money on a copywriter for your sales page or a marketing strategist to help you plan out your launch, instead of blowing it on an ad consultant who’s probably going to implement the exact strategy I teach in Absolute FB Ads. Right now you can grab my course and start to train yourself in the the art + science of Facebook ads that convert. I don’t even like to think of it as a course – it’s a Facebook ad manual that you go to when you need help. It’s a Support Group where you go to get REAL answers, quickly. There’s no way to “fall behind” in this course – you get exactly WHAT you need from it, WHEN you need it. Join us today and save your ad consultant money for the actual ads you’re going to run. I can’t wait to help your campaigns be as profitable as humanly possible! P.S. 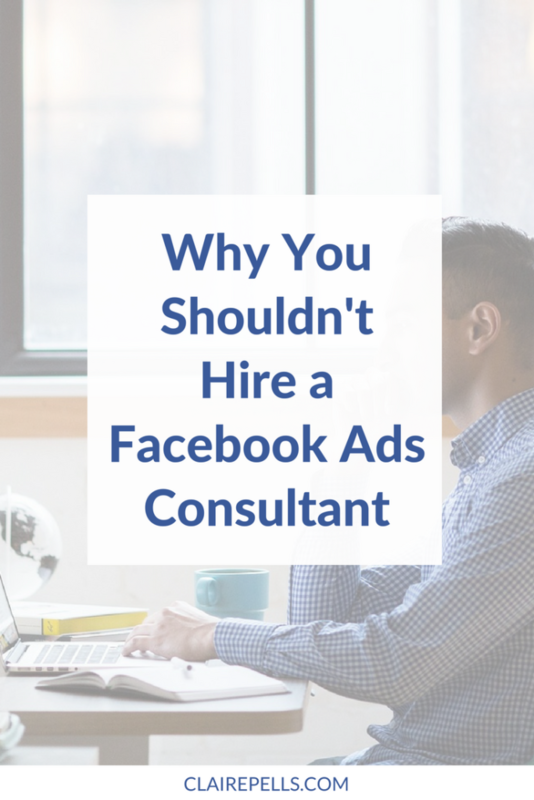 You can only really expect a serious ROI from hiring a FB ad consultant if you’re a) selling $2000+ courses or programs, and/or b) spending $10,000+ on your ads. If that’s not where you’re at yet, save your money for a copywriter who can help you improve your sales conversion rate and learn to run your own ads! Click here to join Absolute FB Ads! !